Of course, “tight race” does not a “scramble” make. 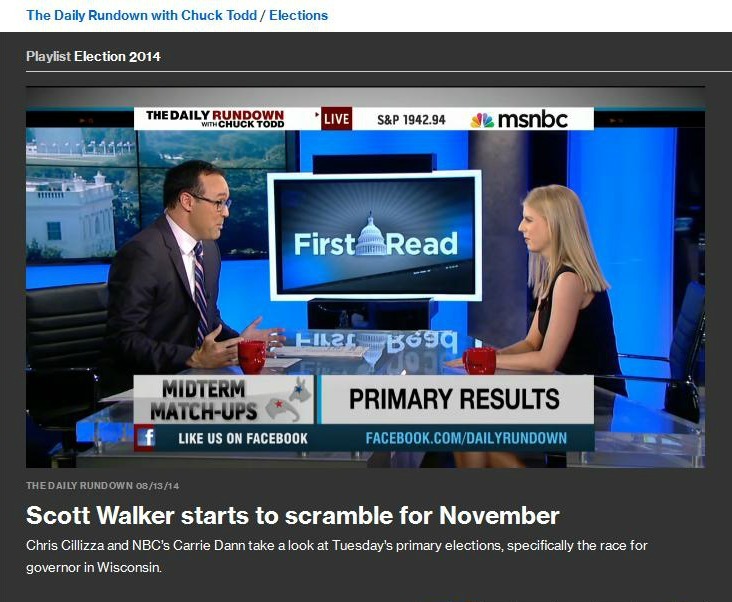 While Scott Walker may be facing a more challenging re-election than anticipated, the rather lame one minute segment by Cillizza did not deserve two teases or a spot on msnbc.com. CHRIS CILLIZZA: Plus, with the primary behind him and before any 2016 talk really gets going, Wisconsin Governor Scott Walker could have a tough road to re-election ahead of him. CILLIZZA: Next, primary results from Connecticut, Minnesota, and Wisconsin. And a look at Scott Walker's biggest fight yet. CILLIZZA: Republican Governor Scott walker, who is running in his third election in four years, is doing his best to make 2014 a referendum on his Democratic predecessor. SCOTT WALKER: Does anybody remember how bad things were four years ago? We don't want to go back to the days of double-digit tax increases, of billion dollar budget deficits and big-time job loss. Remember, Jim Doyle, Jim Doyle hand picked Mary Burke to be a part of his cabinet, to be his chief job czar. We don't need a third term of Jim Doyle's failed policies. MARY BURKE: Right now we're lagging in terms of our economy. We are dead last in the Midwest in terms of job creation under Scott Walker. I know that we can do better than that. I know the people of Wisconsin know that we can do better than that. CILLIZZA: Joining me now, NBC news political reporter Carrie Dann. Okay Carrie, a lot of primaries but let's focus on the race that I think most people are focused on here. Scott Walker versus Mary Burke. Scott Walker held a big rally last night, although no one thought he wasn't going to be the Republican nominee. How much trouble is Scott Walker in? MARY BURKE: Well, you notice Mary Burke also had a primary challenge and didn't do anything last night to recognize that. She's obviously focused on the fall. I mean, I think six months ago we were talking more about Scott Walker, the potential 2016 candidate, than we were talking about Scott Walker winning his re-election race. I mean, this is, as you said, the third time he's running in four years. But I think Mary Burke has really -- the latest polls have shown them in a dead heat and Mary Burke has really worked to make herself more of a pro-business Democrat, less tied to the union interests that walker's previous opponents had been, so I think we're going to be looking at this as a really tight race come the fall. CILLIZZA: Mary Burke not having a primary very beneficial to her because she could position herself as that sort pro-business democrat. Carrie Dann, thank you.